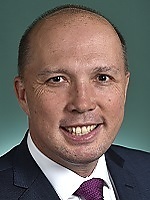 Info Peter Dutton is 33 years old and is a local who lives in the Dickson electorate at Camp Mountain. Peter is married to Kirilly and is the proud father of daughter Rebecca (born in March 2002) and new son Harry (born in July 2004). Peter grew up on the north side of Brisbane and finished high school at St Paul's School, Bald Hills. In 1990, Peter graduated from the Queensland Police Academy and was a police officer until he resigned in 1999 to take up full-time employment managing the family business. During this time Peter also completed a Bachelor of Business degree at QUT. Peter's mother grew up at Albany Creek, where the family had first settled and established a dairy farm in the 1860s. Peter's grandmother, who is 92 years of age, still lives at Albany Creek in the original family home. Peter Dutton is a hard-working person who comes from a small business family and appreciates the hard work required to achieve goals. "I really don't mind what people's politics are," Peter says. "I want to hear what their problems or concerns are, and help in finding solutions. I hope I can use my real-life experiences to find solutions to some of these problems." "I am not a career politician, or a barrister. I haven't spent my working life behind a desk. I want to bring some common sense and real life experience to the position." Peter regularly travels around the electorate in his mobile office to meet with residents and identify the issues of most concern to them. He is happy to attend local meetings of any description to work through issues with constituents. "Please call my office on 3205 9977 to make an appointment," Peter says.
" I am happy to meet with people at my office or at their home or workplace." Peter Dutton is a strong believer in the principle of mutual obligation and in stronger sentencing options for criminals who commit serious offences. He is currently campaigning to have the outdated double jeopardy principle revised in Queensland. 05/18/2019 QLD MP - Dickson ?? ?